We have now at the fag end of the year. You will be seeing quite a few “popular” , “top”, “trends” kind of list in coming days through out the web. We will also be publishing some of the interesting lists that would make an interesting read for all our readers. As we all know Twitter and Facebook have taken the world by storm (especially twitter in 2009), Millions of users have shared billions of updates through-out the year using these 2 platforms. Based on these updates both the companies have mined, collated and analyzed the data to find out most popular and trending topics for this year. 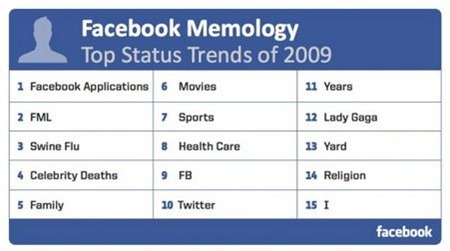 Facebook has come out with what it calls – Facebook Memology and Twitter has come out with – Top twitter trends of 2009. Given these are updates from Facebook – “Facebook Application” was most talked about status update. Think about how many times you must have shared update or asked your friend to join a particular Facebook Application, or even shared your triumphs and successes on a particular FB app. Farmville was one of the most popular apps that was talked about frequently in people’s status updates. FML, which stands for “F*** my life” is now become a routine synonym which is used to display frustrations. BTW, if you have not already visited FML site, you should do it now – one of the most addictive and hilarious user generated updates you will ever read. I knew FML was popular, but never knew it was so popular that it got ranked on number 2 position. Other status updates are very much in line with what we share generally with our friends on a platform like FB – Family, movies, sports, religion etc. If you wondering how “Yard” figured in the list, it is because of the popularity of “Farmville” FB app. At least that’s what I think :) – is that right? 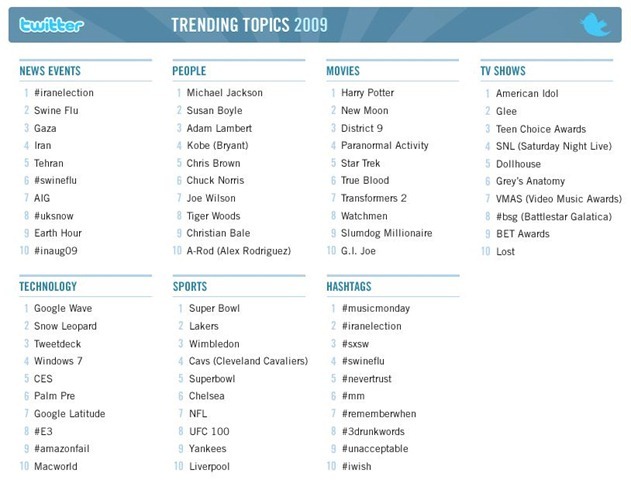 Amongst the people, Michael Jackson’s death was most talked about in Twitterati, while singing sensation Susan Boyle came in as the second most talked about person. 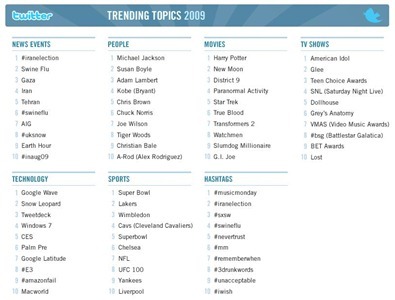 Adam Lambert, Kobe Bryant and Chris Brown completed the list of top 5 most talked about people on Twitter. If you are thinking about Tiger Woods, yes – he also figures on the list at number 8 ! Amongst the movies, Harry Potter was the most talked about, followed by New Moon, District 9, Paranormal Activity and Star Trek finishing the top 5 slots. I am sure “Avatar” will dominate the list for next year ! Amongst the Technology, Google Wave, Snow Leopard, Tweetdeck, Windows 7 and CES were the most popular and frequently used words on twitter ! Please note that Facebook and Twitter are extremely popular and widely used in U.S and hence majority of the trends are related to U.S. Question to Readers –If this was a India centric list, can you name the 5 most popular trends / subjects / updates by Indian FB and Twitter user? well, I can hazard a guess for twitter. #chetanblocks would have made it to the list, despite being trending for one day; so would #cricket which trends whenever there is a match- which is often. In people, Raj thackery/Bal Thakery/Sachin Tendulka woudl have made the cut; and in films, one would be littered with acronyms like APKGK (ajab prem ki gazab kahani), ATB (all the best) etc – testimonial to the fact that we Indians love acronyms for our films so much we cant live without them.